Six days after pitching the St. Louis Cardinals to an 11th World Series title, Chris Carpenter was spending time reliving memories of another sport that he mastered quite well in high school. Carpenter was on the ice with the St. Louis Blues for the team's practice Thursday morning at St. Louis Mills, putting his 6-foot-6, 230-pound frame through some light hockey drills. The 36-year-old Carpenter, who won Games 1 and 7 to help the Cardinals down the Texas Rangers in seven games in the World Series, was having a blast. He was taking shots, parking himself in the slot area and making saucer passes to Blues players, who were loving every moment of spending time with one of the other pro athletes in town. 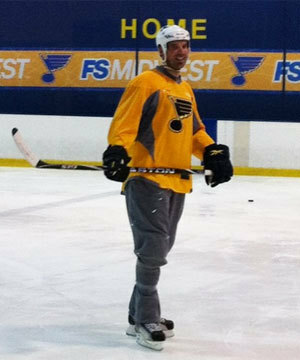 St. Louis Cardinals ace Chris Carpenter, who is coming off a World Series Championship, joined the Blues for practice on Thursday at St. Louis Mills. "It's awesome," said Carpenter. "For these guys to even give up some of their time to allow me to come in here, I know what it's like ... I just wanted to get out of everybody's way, just watch really, and then they invited me to come out here and skate a little bit. "It was a lot of fun. I was just hoping not to embarrass myself. But they were all great." Carpenter, who was joined at practice by recently retired Cardinals manager Tony La Russa and Cardinal athletic trainer Barry Weinberg, has a hockey history. When he was 16, Carpenter was an all-state defenseman for Trinity High School in Manchester, N.H. He was an all-stater his last three seasons in high school, and scouts from the Chicago Blackhawks and Boston Bruins were checking to see if he had an interest in pursuing hockey on a full-time basis. "It was always a dream to do (play hockey), but I think I chose the right route," said Carpenter, who was drafted by the Toronto Blue Jays with the No. 15 pick in 1993. "Hockey made you much tougher, I know that. Growing up playing hockey made me much tougher than baseball would have. It's a tougher sport, funner sport. I enjoy it a lot." The Blues, who have been going through a tough stretch with a 5-6 mark, enjoyed having the World Series pitcher skate with them. "It's good when you've got stuff like that," defenseman Carlo Colaiacovo said. "The Cardinals and us have had a really good relationship with each other. We've had batting practice with them, we've shared some time at the ballpark. "I think it's awesome to respond in this sort of matter when a guy like that comes on the ice and have some fun with us. He looks great. He can shoot the puck, he can skate. I asked him if he plays in any men's leagues and he goes, 'No, but when I'm done (playing baseball), I'm going to be playing.'" The players were asked jokingly if any of them felt threatened that Carpenter would steal some of their ice time. "We were joking about it that maybe we could use him on the power play to help us out," defenseman Alex Pietrangelo said. "He seems like a pretty good player out there. He's probably better at hockey than we are at baseball. It's good to see him. I think we all know he's a pretty good athlete." Carpenter, who is an avid hockey fan, has season tickets for Blues games. He will be on hand, along with La Russa, to participate in a pre-game ceremony Friday where La Russa will drop the ceremonial first puck prior to the Blues hosting the Vancouver Canucks. But for one day at least, Carpenter was able to live out a dream of playng hockey again. "You don't realize how fast (hockey players) are until you get close up," Carpenter said. "You can sit in the stands or watch on TV all day long. But these guys can fly."